S3 pupils from Elgin Academy came first in a competition for computer coding. L-R: Matthew Hamilton, James Orr, Daniel Campbell, and Adam Govier. 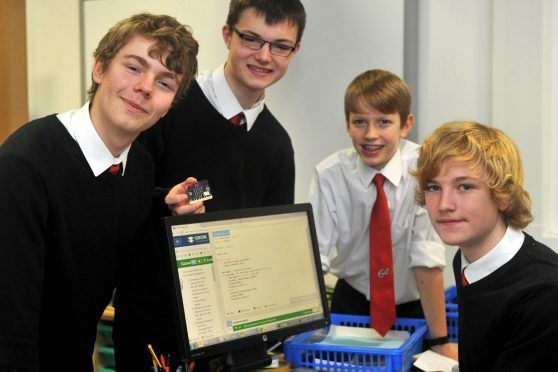 A teenage team of crack computer coders at a Moray school have beaten off global competition to design new software. Four S3 pupils from Elgin Academy used micro-computers to devise algorithms that could run a jukebox, quiz and stopwatch. Adam Govier and Daniel Campbell were two of only eight students from more than 5,000 entries worldwide to get full marks in the Grok Learning contest. Classmates James Orr and Matthew Hamilton also made it into the global top 10. The pupils were given a weekly brief to design a program – beginning with a simple code to switch on a lightbulb up to a complex sequence of hundreds of letters and numbers that could run a game show-style quiz. The computing students have been learning the python code during classes at Elgin Academy. Jukeboxes designed by the students have been programmed to play about a dozen songs at the click of a mouse, including classical tunes and happy birthday. A picture to accompany the melodies is also displayed on the computer monitor while the music is playing. Hopeman teenager Adam Govier is now eager to pursue a career in designing software. He said: “I would like to do computer programming in the future. I do it as a hobby at the moment but I find it fun – I like the problem solving part of it. Computing teacher Donald Mackay explained that programming had several educational benefits and that although there was no prize for the teenagers they had undoubtedly claimed “bragging rights”. He said: “It encourages logical thinking and it’s also good for problem solving, which can be applied in a number of subjects or in life.